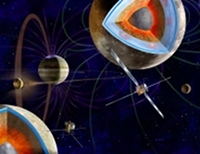 The Europa Jupiter System Mission (EJSM-Laplace) will be an international mission to the Jupiter system to be developed in collaboration between ESA and NASA. The offspring of the "Laplace" mission - proposed to ESA for the Cosmic Vision plan - and NASA's two Outer Planet Flagship Mission studies, "Europa Explorer" and "Jupiter System Observer", EJSM-Laplace was born from a joint study that started in early 2008. The reference mission architecture for EJSM-Laplace that has been studied since 2008 consists of two flight elements: i) the Jupiter Ganymede Orbiter (JGO), assumed to be developed, launched and operated by ESA, ii) the Jupiter Europa Orbiter (JEO), assumed to be developed, launched and operated by NASA. JGO is one of the three candidates for the first ESA Cosmic Vision L-class mission slot, with a possible launch in 2020. JEO will be implemented by NASA, as the next Outer Planet Flagship Mission, with a launch in 2020 and has received pre-development funding. In 2010, ESA finished three parallel assessment studies with three industrial teams and their output is summarized together with the mission science in the ESA Assessment Study Report, also known as the Yellow Book, which has been prepared by the Joint Science Definition Team (JSDT) – the body formed to define the science objectives and provide science guidance to the collaborative study activities in Europe and in the USA. The mission science and the Yellow Book are being presented to the scientific community on 3 February 2011. The team is now preparing for the next phase (Definition Phase) and for the Announcement of Opportunity (AO) for instruments, which would be issued in the event of EJSM-Laplace being selected by the Science Programme Committee. This decision is expected in June 2011. The Jupiter Europa Orbiter pre-Project team continues to define the spacecraftfs architecture, working toward a Mission Confirmation Review. In parallel, NASA is preparing an AO for potential instrument proposers. The report of the JSDT to NASA was issued on 15 November 2010, and is now available online. The results of the Planetary Science Decadal Survey will be published in March 2011. EJSM-Laplace is based on a strong ESA-NASA collaboration. The mission will further develop the cooperative spirit within the outer planet science community forged by the Cassini-Huygens mission to the Saturn system. The EJSM-Laplace mission can be complemented by additional elements that are being investigated by other international partners, such as a Jupiter Magnetospheric Orbiter (JAXA), a Europa Lander (RSA) and a Europa penetrator (ESA-UK study).